In today’s competitive business world, you need subject matter experts in Search Engine Optimization (SEO) and online marketing to get and stay ahead of your competition in this ever changing digital age. SocialSEO has two decades of experience helping companies effectively promote their brand, products, and services on the internet by driving traffic to their web sites. Our teams and Seattle SEO consultants provide world class service with the aim of ranking your website at the top in search engine results, and converting page views into profitable engagements. We offer an unparalleled and comprehensive approach to digital marketing. We understand the technology behind SEO and know that if you don’t stay up-to-date with the constant evolution of SEO methodologies, the competition can get the upper hand. As well, we leverage the power of social media and paid advertising as ways to drive traffic to your website. If you’ve had an online presence for years or are new to internet marketing, our teams take the time to learn your business in order to create strategies designed to achieve your website’s goals and objectives. Once a direction is defined and strategies for executing marketing plans are in place, SocialSEO will launch each campaign, manage each effort, analyze results, make adjustments, and keep you abreast of changes. Using us to manage your online marketing efforts is like having a whole new department at your fingertips whose primary aim is to meet and exceed your business goals. Depending on the level of service you require, you may have multiple teams working from different angles on your behalf – SEO consultants to increase and manage organic traffic; a Social Media team to build a following through Facebook, Twitter, Google +, LinkedIn and other platforms; Content Writers providing fresh and engaging language designed to capture the attention Google’s and other search engine’s algorithms; PPC experts to design ads and manage online ad campaigns; and, web developers that build of fast, user-friendly websites. Dedicated to increasing traffic from both organic and paid strategies, we allow you to focus on your company’s core competencies while we promote your name, products, and services. Some of the SEO work we perform include advanced keyword mapping, competitive market analyses, citations, review strategies, e-commerce SEO, content management, and so much more. Our specialists offer measureable results and track metrics to identify traffic trends and rankings. Complex and constantly changing, the science SEO is so involved it even has its own periodic table of elements! Why does your Seattle business need SocialSEO? Because SEO methodology is so complex and always evolving, a competitive business environment, like Seattle’s, the practice of SEO is one that must be constantly in play to keep your website consistently ranking high. 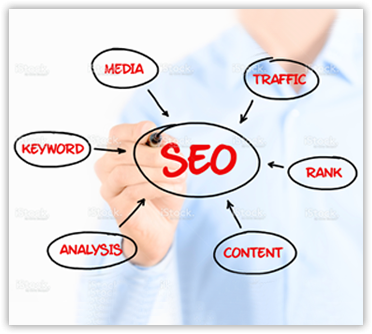 And that takes a multi-disciplined team of experts trained in SEO and online marketing methodology. Not only can we rank you high in general industry searches, SocialSEO is an expert in location targeting. Through industry best practices and creative strategies, we can put you in the top of rankings in your city or even a neighborhood. Pay-Per-Click (PPC) is another method of internet marketing which is simply a way to buy visitors. PPC typically generates results immediately. And, search engine advertising is extremely popular – Google makes tens of billions of dollars a year advertising links to other websites. Its popularity is due in part to the fact that a $2.00 PPC fee from an ad or keyword can result in a $300.00 sale. The return on investment is huge! In any marketing effort, content is king. Each of your website’s pages must be written with SEO in mind. This involves not only informative, well-articulated, and eye catching content but industry specific research which is used to determine voice, style, tempo, and format of written content. Our professional writers are trained to maximize SEO opportunities through the written word. In addition to providing web content, our writers draft press releases, write traditional marketing copy, blogs, and are experienced in reputation management. The advent of social media has changed the way businesses reach out to customers. Utilizing social media as a marketing plan involves strategic planning and sound execution. With multiple paths, strategies, platforms, and methodologies available to increase your website’s traffic, it is a must that your brand image remains consistent throughout each one. Multi-pronged marketing campaigns should be cross-platform compatible, dynamic, and ongoing. And, branding isn’t a process that ends. Staying in front of your customer demands a strong and robust online presence that is fresh and relevant to the times. With SocialSEO as your Seattle online marketing expert, you will have a professional and dedicated staff whose only goal is to increase traffic to your website and convert visitors into paying customers. Contact us today and learn more about what we can do for your Seattle business.